Children are not known as the tidiest of people, and that is just fine. Except for a select few people, we all learned to clean up after ourselves only after we’ve moved away from home and the mother we’ve been taking for granted for too long. The only person suffering in this situation is the adult whose job it is to clean up after the rest of the family, and most of the times, that means mom. Some families sorted that out, though. Their youngsters have strict routines that they have to stick to, or else they get repercussions of some sort. It is much easier teaching your child to pick up after itself if the result is worth it, and the result is only the aesthetic of the room. If the child’s room is designed to look better when it is neat and tidy than when there’s a creative mess at your feet, the room will stay clean for longer than any other room. Tips on getting it that way: be very careful about not breaking your color scheme. We are past the age when pink and blue are the only color possibilities, but it is a fact that the two genders react differently to different color combinations. What these tidy rooms have is a systematic organizational and storage plan. 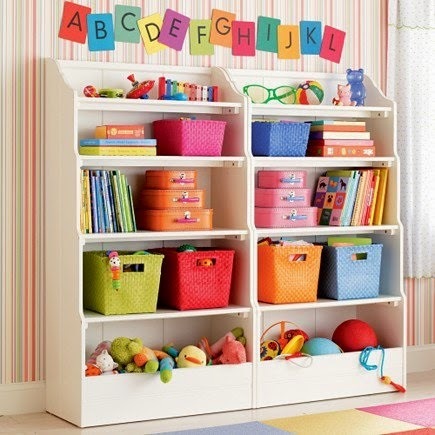 Read on to learn about the most practical storage units you can put in your child’s room, and not ruin its imaginative nature. When the child grows up and starts reading Dostoevsky, vintage bookcases will make sense. While it is still a crawling tot, everything he or she can get invested in is either an oversized picture book, or one of those 3D felt baby’s first books. These things do not fit in a vintage bookcase physically or stylistically. What you need are the ever popular cubic bookcases that minimalism-loving adults typically prefer to keep in their living rooms. Cubic bookcases can be stacked with books of all shapes and sizes, and they can also fit other relevant didactic material like educational toys and board games. You can also place a dandy stuffed toy to hang off the edge of this sort of bookcase. There is enough room for it, and it makes the whole area more inviting to younger minds. Hampers are an attractive addition to any hipster room. You can get them at any market place or plastics store. The problem is that these plastic hampers are repulsive, more often than not. They are also often too deep for a child to reach into, and thus, toys get lost. The best thing you could do is to find tall hampers and short hampers, either wicker or plastic, and use the tall ones to store larger toys that are hard to lose in boxes, and the shorter ones for smaller or more fragile toys. Keep them geometrically next to each other for an added aesthetic element. It is important to buy all hampers in one go, and to buy them in the same print, because having mismatched storage units is, if possible, even more unattractive than having toys scattered all over the floor.